Message Guard memory: protects against the loss of messages in the event of a power failure, so you can listen to your messages after the power returns. No batteries required. 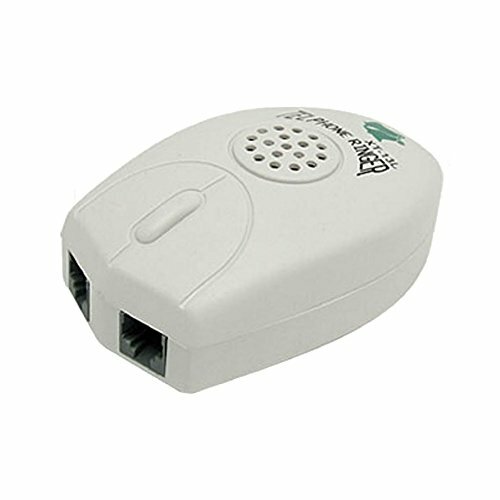 The RJ11 Telephone Ringer wonders in pronouncing incoming calls particularly in noisy places. Note:Package only included one ringer,no another cables included! Size:9.3cm long ( at the longest ), 5.6cm wide ( at the widest ), 2.7cm thick. ( at the thickest ). The ClearSounds ANS3000 delivers loud, crystal-clear messages to you. 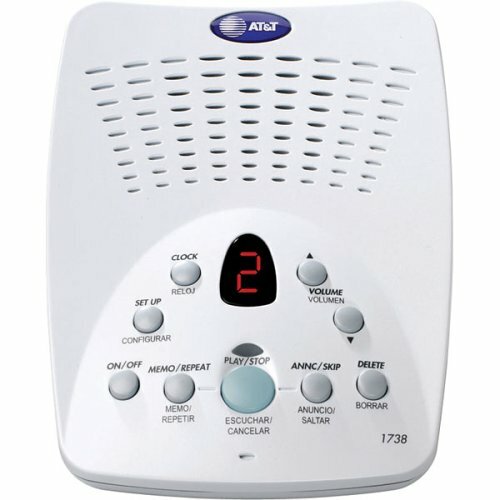 This digital answering machine amplifies sounds up to 30dB and can be adjusted to 10 levels. It even has three speech playback speed level you can select. This means you can slow down the saved memo to hear the message better. 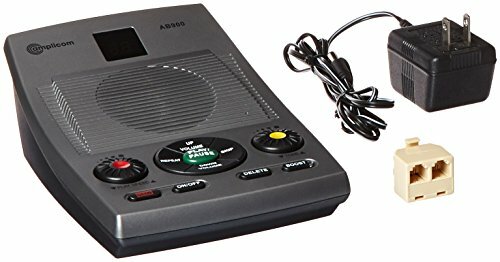 The ANS3000 Amplified Answering Machine is an excellent tool for screening calls. You don't need to answer messages pronto. You can listen to incoming calls first. 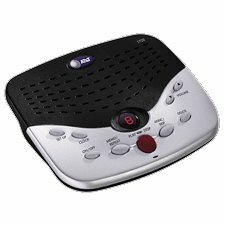 The answering machine can record up to 3 minutes of auto-memo and supports English, Spanish, French languages. The device even has a time/day stamp, so you know when the message was made. CALL SCREENING - allows you to listen to incoming callers leaving a message without answering the call. To answer the call, simply pick up any phone on the same line. 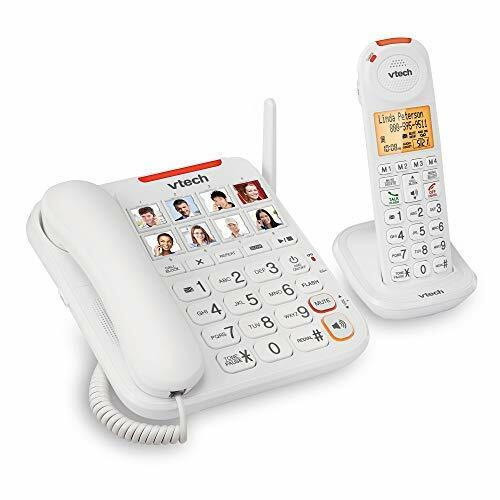 Designed for seniors or the hearing impaired, the VTech SN5147 Amplified Corded/Cordless Phone with Big Buttons and Display comes with features to make hearing and dialing calls easier than ever. With big buttons, large displays, and a full-duplex speakerphone on each device, this senior-friendly telephone system takes the guesswork out of dialing calls. Attach a photo to each of the 4 photo speed dial buttons on the Photo Dial handset and call frequently dialed phone numbers with one touch for quick access to friends and family. 50dB Audio Assist: Temporarily increases overall volume by up to 50dB and enhances sound frequencies that make speech easier to understand. Photo dial: Never forget whose number is whose. Program eight frequently dialed phone numbers and attach a photo to each one for convenient speed dialing. Big buttons, large display: Oversized buttons and an easy-to-read display screen make the system super easy and comfortable to use. 90dB ringer volume: The extra-loud ringer makes it easy to hear incoming calls throughout your home. The Aiphone CCS-1A ChimeCom 2 single-door answering system maintains security by enabling audio communication with a visitor without opening the door. 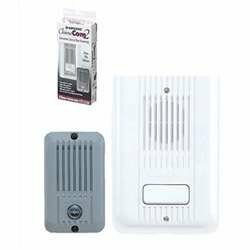 The door intercom can be connected to preexisting doorbell wiring for simple installation. 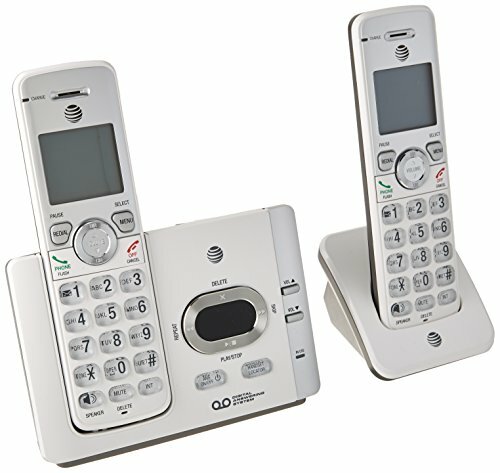 The door intercom has a call button that is backlit for visibility and activates a muted chime on the door intercom itself as well as a two-tone chime on the white plastic master intercom to alert the master intercom operator. The master intercom has a push-to-talk button that receives audio from the door intercom once released. The audio transmission times out after 15 seconds. At any time, the push-to-talk button can be pressed to listen through the door intercom. Both the chime and the audio volume have adjustable sound levels. Housing is white plastic for the master intercom and gray plastic for the door intercom. 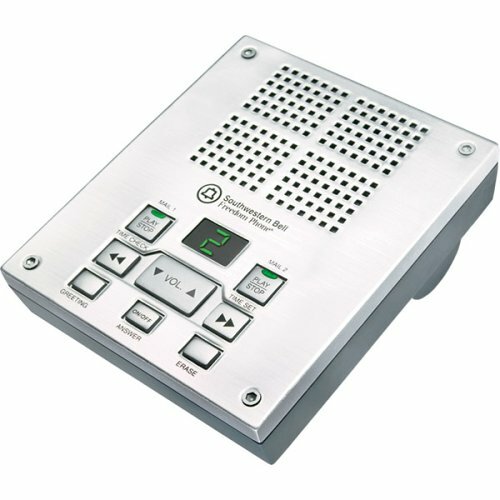 A second master intercom (sold separately) can be added for large areas or multiple rooms. Specifications Overall dimensions (master station) 7 x 4-3/4 x 1-5/16 inches/180 x 123 x 33 mm (H x W x D)* Overall dimensions (door station) 4-1/2 x 2-3/4 x 1-3/16 inches/114 x 70 x 30 mm (H x W x D)* Maximum door distance from master 245 ft. using a 22 AWG wire, 590 ft. using an 18 AWG wire Compatible wires (door to master and between masters) Aiphone 822202 or 821802 (sold separately) Power requirements 12 to 16V power with a no-load voltage rating of 20V or less. Use bell transformer or the Aiphone PT-1210N AC transformer (sold separately). *H is height, the vertical distance from the lowest to highest point; W is width, the horizontal distance from left to right; D is depth, the horizontal distance from front to back. 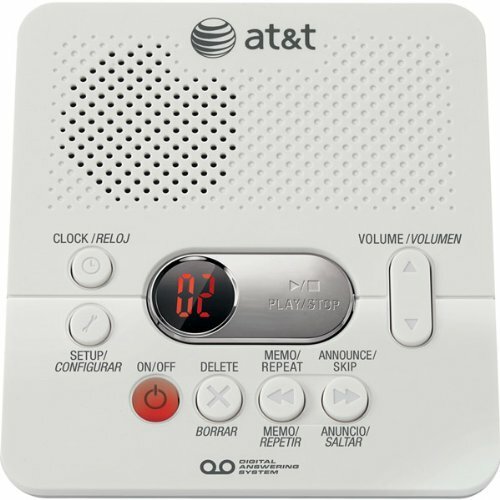 AT&T 1719 Digital Answering Machine with Audible Caller ID. 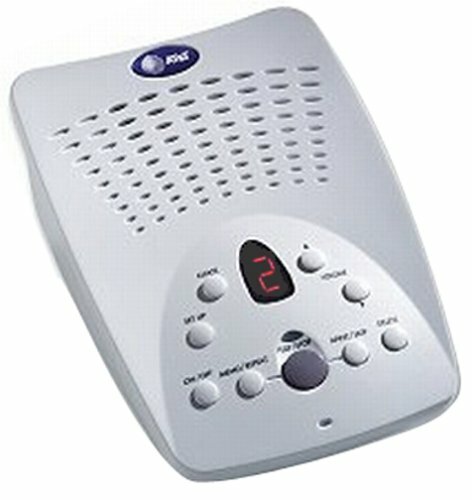 Windchill White Digital Answering System, Excellent Sound Quality, Message Counter, 19 Minutes Of Digital Recording Time, Time/Day Stamp, Message Guard Memory For Power Failures, Remote Access With Toll Saver, Call Screening/Intercept, Number Announce, Variable Speed Playback, Memory Monitor, Memo, Voice Prompts, Audible Message Alert. 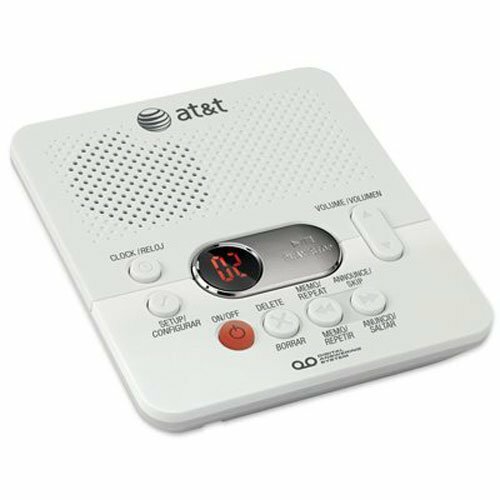 Manage your calls with versatility and convenience using AT&T's model 1719 digital answering machine. The device holds 19 minutes and up to 100 voice messages, all of which are committed to non-volatile memory so you'll never lose a message--incoming or outgoing--in the event of a power failure. When you're home, take advantage of a variety features designed for convenience. Announcement monitor lets you hear, if you wish, the outgoing announcement and resultant messages. Number announce verbally announces an incoming telephone number before you answer the call. Number store causes the system to announce a caller's number as it plays back a message. Call screening/intercept lets you pick up after someone has begun leaving a message. Audible message alerts beep every 15 seconds when you have new messages. Multispeed playback lets you listen to messages at half, normal, or double speed. You can also choose to accept calls from blocked numbers or present callers with a message alerting them that you do not accept calls from blocked numbers. Answering machine with single fixed RJ-11 phone-jack cable, AC power adapter, and a user's manual Note: Number announce/store and the blocked-number feature require caller ID, a paid service from your local phone company. Now you can order Caller ID from your telephone service provider, without having to run out and buy a new phone. Simply plug in this compact unit between your phone and the wall plug, order the service, and you'll be good to go! 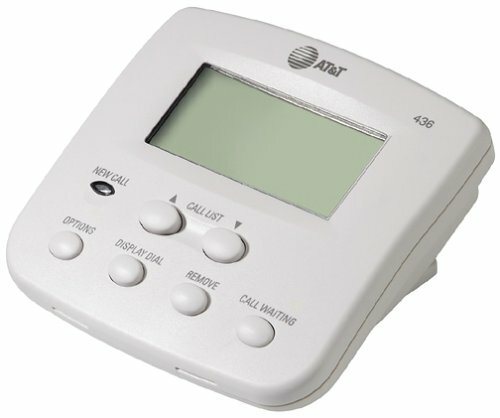 With a flat design equally at home on your wall or desktop, the AT&T 436 Caller ID Box provides three lines of information on its LCD. The 90-entry name and number log coordinates with the one-touch dial for instant return of important calls, and each incoming message automatically receives a time-date stamp. A call-waiting button lets you know the identity of new callers when you're already on the line. Names can be displayed in Spanish or English. The manufacturer includes a one-year warranty on parts and service. Requires two 2.4 V nickel metal hydride battery. DECT 6.0 technology. Caller ID and call waiting. Expandable to five handsets (EL50005). Two to handset system. Warranty: One year. 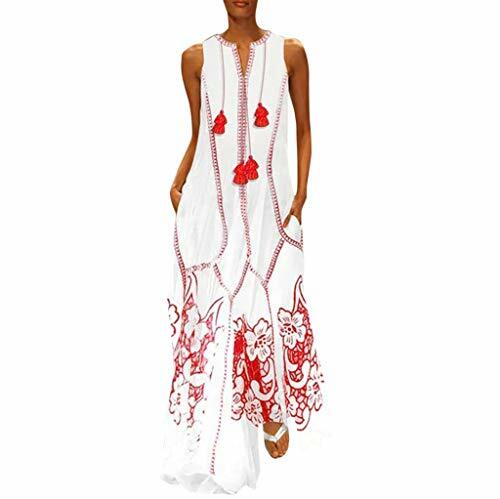 POTO Material:Cotton,High quality material,which is stretchy,comfortable and durable,making you look amazing during Hawaii,Entertainment,Party,Daily,Casual,etc.the dresses'design is elegant for decoration,very fashionable and creative,relaxed,summer makes you more attractive.Package include: 1 PC Women Dress. 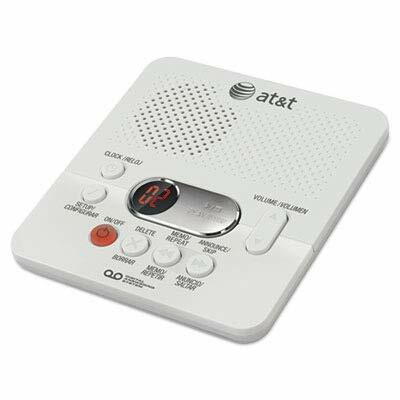 Enjoy all the convenience of dial-in remote access and none of the hassles of hissy, imprecise analog answering machines thanks to AT&T's compact and affordable 1726 digital answering system. It offers three separate voice mailboxes and is compatible with paid services like caller ID (announce, not display) and call screening/intercept. An extended record time of 40 minutes means you won't have to erase your messages just to have free storage space for new messages, and the device even lets you move messages between mailboxes for convenient file sharing with other household members. A two-digit message counter informs you of how many messages are currently in each mailbox. 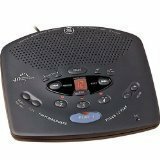 GE Digital Telephone Answerer with 4 Message Mailboxes and 2 Digital Outgoing Announcements, 40 Minute Recording Time, Touch Tone Remote and Message Retrival System. Ideal for small offices or busy roommates, the GE 29869GE2 is a completely digital answering system containing four mailboxes. The call-screening speaker allows you to answer only the calls you want to; you can even set the precise number of rings before the machine picks up. With 40 minutes of memory, you won't worry about running out of space, and you can easily set a time limit for individual messages. Each incoming message automatically receives a time-date stamp, and simple controls offer the options of listening to only the new messages or listening to every message, along with deleting, saving, or skipping. Remote access allows you to check in while at work or on vacation, and with the addition of a 9-volt battery, the machine is able to save messages even through a power outage. GE provides a one-year limited warranty on parts and service.